A growing space should be a pleasure to our senses, a thing of beauty that is full of flavours, scents, colours, textures and noises. It should also be a place of leisure and a home for life. Growing your own food is an act of love for yourself, it is physically, nutritionally and emotionally good for you – and it saves you money. To produce and consume your own food is also an ecologically and ethically sound act which reduces your carbon footprint and helps to make your life more sustainable. In addition to this, it is a political act. To produce your own food is a form of positive activism against the large producer bodies which try to justify ecologically unsound agricultural methods and the never ending transfer of foodstuffs around the world. Edible gardens,ornamental vegetable/kitchen gardens and potager are all terms used for areas where crop-yielding and ornamental plants are grown together. Under the edible garden heading I would also add forest gardens and orchards. They tend to be less ornamental but no one can doubt their beauty. 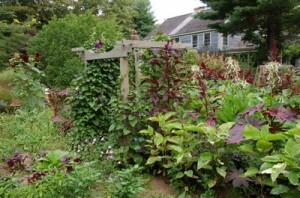 Edible gardening or landscaping are just terms that cover gardening that marries aesthetic design with crop production. Edible gardening isn’t a new idea but it is seeing a revival. In France the most common traditional form is called a potager; these often have geometric designs with low hedges of box or herbs etc. around the vegetables which gives a formal structure to the garden. 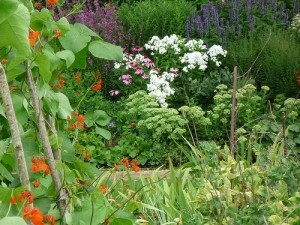 In Britain the traditional cottage garden contained a host of crop-yielding plants but in a much more informal manner. The Forest garden is perhaps a new form of gardening but I suspect it is the oldest, in that people living on woodland edge would naturally have planted useful plants nearby where the sunlight was adequate. Forest gardening involves growing plants in layers to mimic the edge of woodland but it uses edible and useful plants to us. So a nut tree may have currants below with leafy green vegetables below this and strawberry plants creeping around in between. Orchards have been a part of people’s gardens for centuries and these were not limited to trees bearing fruit and nuts. Often they would also contain berry bushes and willow for weaving as well as providing grazing for fowl, sheep and cattle. I feel that our standard vegetable plot also has its charm and place. With a little thought put in to its layout and how to merge it into the rest of the garden it can become a positive design feature rather than the area to be hidden at the bottom of the garden. So there are styles of edible gardening to suit all situations and no one says you have to have just one style. With new breeds of plant and growing techniques we have more miniature and ornamental crop-yielding plants to choose from than ever before. You could have a miniature forest garden or orchard with a few chickens underneath in an urban garden and enjoy the beauty as well as the bounty. Some people like a vegetable plot with its straight lines of vegetables, own charm and character and promise of bounty. Others find these too utilitariian in looks and have not the space to tuck one away behind the flower beds. In the all-in-one edible garden both vegetables and flowers can be grown together to give a beautiful and productive garden that is well balanced. Vegetables are now available which are more attractive to look at. 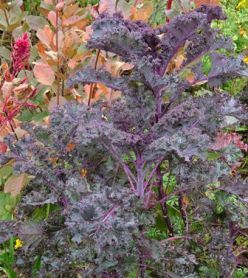 Chards come in a wonderful mix of bright colours, runner beans have such pretty flowers whilst deep purple kales, red frilly lettuce, bronze feathery fennel and a host of others can all enhance an ornamental bed. Fruit can be grown up walls, used to create hedges, edge the front of borders and provide structure as trees. Flowers and herbs will provide pest control and attract pollinators, as well as providing perfume, texture and colour. With careful design and planning all gardens, whatever their size, can be both beautiful and bountiful. 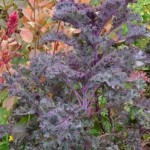 Below are some of the edible plants which are very suitable for the all-in-one bed. If your flower bed is a little thin why not try some in patches rather than buying bedding out plants, shrubs or perennial flowers. Globe artichokes (perennial), Parsley (curly leaved variety), Leeks, Lettuces of all colours and textures, Runner beans, Black Tuscan kale, Chives (perennial) Mizuna greens, Dwarf French beans in yellow or purple, Blackcurrant bush (perennial), Chards, Rhubarb (perennial), Wild strawberries (perennial), Seakale beet (perennial), Tomatoes, Beetroot.